I was expecting the Watcher in the Water or one of the drowned people from that mere on the way to the crack of doom. Tolkein doesn’t really lend himself to mermaids does he? For me the dress of the Watcher in the Water would be certainly too creepy. I remember that when I read that part of the book last winter and then had to go to the swimming lesson I was feeling quite horrible. 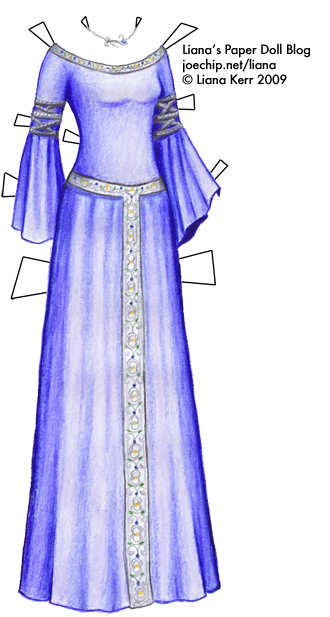 But I would suggest something Tom Bombadil’s wife Goldberry would wear. She was a river woman’s daughter. Well I’m crazy about LTR. Would you like me to provide you with some descriptions of the clothing? Or any specific scenes? I love your website!But can you make more dolls?Can you make cloths from the movie ”the sound of music”?I’m turning 8. I am in second grade.